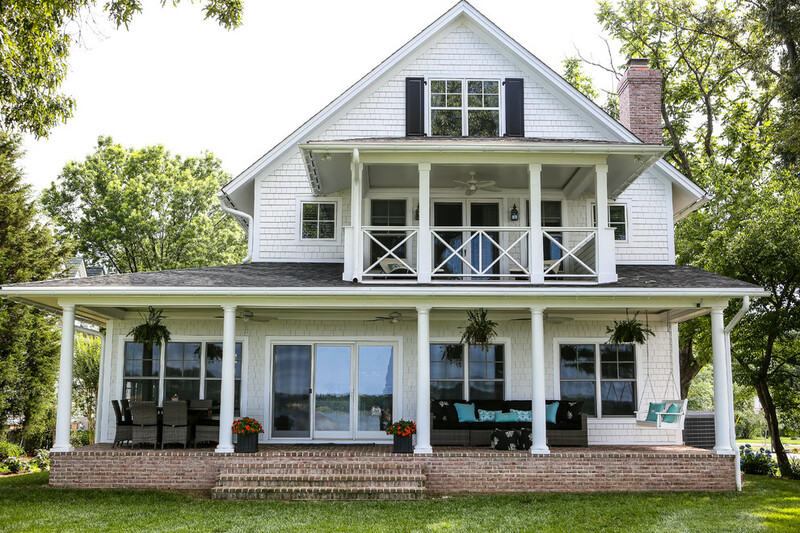 This is a beautiful Colonial home with classic columns, shuttered windows, and dormers.The house boasts exceptional taste and luxurious upgrades through the indoor and outdoor living spaces.This project began with the removal of the existing home, space was then transformed into a dream home on the Magothy River waterfront. This home has a wonderful two story porch with a brick stoop. The white shake siding is beautifully trimmed and accented. The addition of black shutters and architectural columns complete the stunning design. An elegant and detailed entryway featuring a paneled door, decorative window transom, and side light. 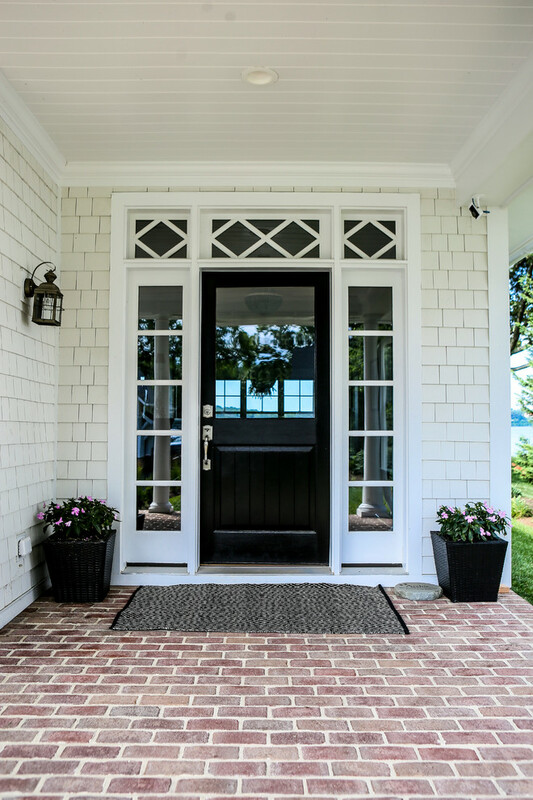 The exterior has shake shingle style siding, beadboard ceiling, and brick porch. This bathroom design incorporates an exquisite combination of tile work, generous proportions, abundant natural light and ample floor space. This photo gives a detailed look at the custom arabesque listello tile accent. This beautifully designed cabinetry is a perfect example of form and function coming together to add built-in storage and beauty to this bathroom. A stunning entryway shows a variety of building materials combined to make a gorgeous statement when entering this home. The paneled door with detailed transom, sidelights, and additional windows add warmth and natural light. The paneled wall and beautifully detailed molding join the rich hardwood floor to complete the welcoming feel of this entry. In this photo, we see classically designed built-in shelving and entertainment center. This feature adds both functionality and beautiful craftsmanship to this space. This lovely room has plenty of natural light, upgraded molding and shaved hardwood flooring. The addition of bright colors and fun accents make it the perfect bedroom space. The dark walls and beadboard ceiling add interest and highlight the unique angles of this boys bedroom. The large double window and nautical sconces ensures that the room feels full of light. A detached three car garage adds ample storage. The design elements such as shake siding, carriage doors, and gable roof ensure the cohesive charm throughout the property. An enchanting family room is created with fun fabrics, bright accents pieces, upgraded moldings, beadboard ceiling and a built-in wet bar. Classic exterior, in ground pool, detached garage and beautiful waterfront views make this home an exquisite property. Classic exterior, in-ground pool, detached garage and beautiful waterfront views make this home an exquisite property. The built-in bench with storage cubbies add an extra benefit to this hallway. This kitchen island maximizes space for cooking and entertaining. The large teal pendant lights and wicker chairs add focal points and contrast to the white cabinetry. The large entry, built-in bookshelf, crown moldings and transom window all add to this idyllic master bedroom. The clever use of the knee wall, doubling as a headboard, add both form and function to this masterfully designed space. 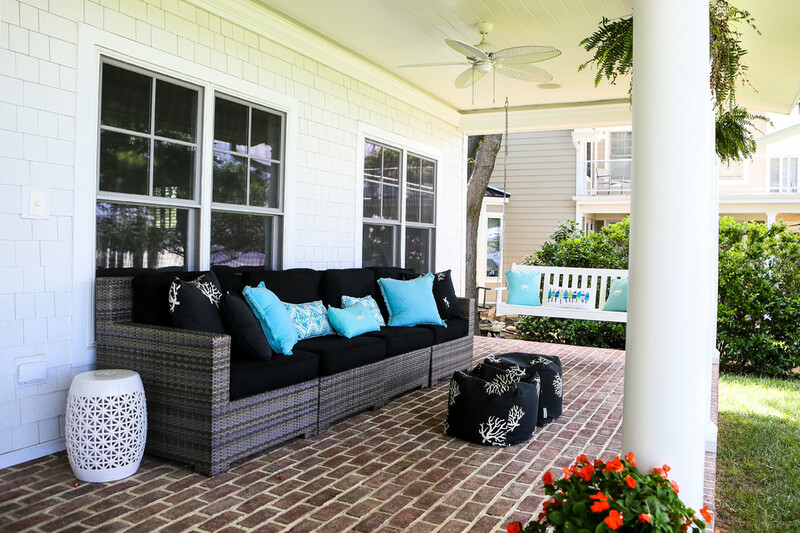 Serene southern style porch adds space to enjoy the outdoors and the wonderful views this waterfront property has to offer.